Well, it's that time again to update my equipment. here is my problem, so many good sonars out there that's it hard to pick one. which one would you buy for all around ice use? Have used Vexilars for quite a few years and am very happy with them. There weren't that many brands to choose from when I purchased my first one so that made it a little easier chioce. I have the FL-18 and I think that it is a very good unit. Vexilar also has excellent customer service. I have not fished with the LX-3, but I have heard very good things. I think you would get a very good unit if you chose either one. I just upgraded from an old (Sitex) FL8 to the new LX-3. Wow, what a difference. I've only used it 3 times and so far I am very impressed. Now for the bad news. The LX-3 and the FL18 are $400.00 bucks; that’s a lot of money. You may consider looking at either the Vex FL8slt (?) or the Marcum LX1. Both units have the bright display, which is really nice, but neither have the zoom feature. At this time I really don't think the zoom is worth $100.00 but I may change my mind after using it more this year. Anyways, check out more than just the FL18 and the LX-3 and decide if the zoom feature is worth the money based on the type of fishing you do. Regardless of the unit you pick, they are all nice and will last a long time if taken care of properly. I'm buying a LX3 maybe today, if I have time, seems like the LX3 is as good as the vex, with maybe a better screen, I'm sure I'd be just as happy with the vex, but I'm just going to be different. The auto zoom on the FL-18 rocks! That's what I have. So does the adjustable zoom on the LX3 which my buddy has. It's not a must, but sure is nice! I think it was worth it. Has anybody used the Lowrance X67C yet? The VS560 is the new MarCum underwater camera. The LX-3 offers adjustable zoom (zoom window can be moved anywhere in the water column not just the bottom 6 ft. as is the competition). You'll also find the MarCum has the best target separation and interference rejection available. Good luck with your decision, they are both great units. I have both the Vexilar and the LX3 and I like the Lx3 much better. Easier to read and it has an adjustable zoom. I bought a Lowrance X67C, the only issue I heard is that it picks up interference from other flashers on the area. But I have yet to see that happen yet, although it is early in the season. If this didn't have the summer mode, I would have bought the Marcum. Someone explained to me once, but I still don't get it - with the Vex, what's the difference betwee bottom-lock and auto-zoom? I was planning $269 for a Fish Trap Pro, but just bought a Scout for $75, so have a little cash burning a hole. I see a good flasher in my future - no more 1-color Humminbird! Auto zoom on a vex zooms in the bottom 6 feet of the lake it gives you a split screen with the entire water column on one side and the bottom 6 feet on the other. The bottom lock is a feature primarily used if you plan to put it on a boat. If is to help keep the unit locked on the bottom in waves rather than having it bounce up and down on the water. Then the LP feature is a low power feature that you can use in shallow water situations were you are picking up to much junk on the screen. The bottom lock feature isn't something that you really are going to use when ice fishing and if you do I don't want to be on that lake haha. I have now used both MArcum and Vex. Both are worth the money. I do like the LX-3 LCD charger. trickle down and auto shut-off charger system that provides a percentage read-out of power. I was always in question with my vex. "Just how long should I charge the mutha"?! Now I don't have to worry about it! However, both are fine products! Goodluck with your decision, not an easy one! has anyone ever fished a vex next to a lx ?does one interfere with the other? or does one drown out the other? if i fished with buddies that had vexs i'd sure hate to drown them out or have so much interference that it would render it unusable. Zercom pro! with ice ducer cost me 100 bucks, add a Eddie Bauer camera case to put it in, and your all set! A flash on the screen equals a fish, no matter what color or how clear it is! Fl-18 and while ur at it a dual transducer! Im with localguide on this 1. Ed nice art! 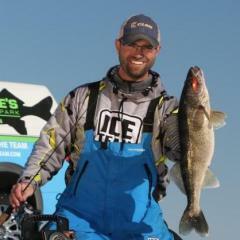 Just had my Lowrance Ice Machine out Sunday for the first time and I love it. Great flasher plus the ability to use the two graph modes also. I baught it because I needed a flasher and a graph for the boat so I killed two birds with one stone. I have never fished next to another flasher before so I am not worried about "IR" beside I have three graphs and a flasher on the boat and havn't had a "IR" problem with them but maybe that's different. WOW I am listening to "A Saucerful Of Secrets" while I write this and it's kinda tripping me out, probably too early in the morning for this particular Floyd song. EYE-EXIST,We have been using my LX-3 right next to my friends FL-18 and both of us can remove any interference from the other without any problem.The best way we have found is to set the IR on one unit and then the other.Both are great units and you can't go wrong bying either.I like the features on the LX-3 but thats just apples and oranges.Have fun fishing with a merry x-mas to you all. I've got the FL-18 and enjoy the zoom feature of the unit. IF you had an FL-8 and then just saw how the FL-18 zoom's feature worked...you'd be running to the store to purchase your very own FL-18! ....on the other hand, I was talking to MJ5 on the ice Tuesday afternoon and he was showing me the MARCUM LX-3. I was skeptical at first, but after he was showing me the 2 zoom features and the seperation from the target...real nice. Both units will do what you want it to do. Just remember to tuck it in at night and give it a nice kiss because the vex. or marcum is the best pieces of equipment to have. It was nice to hit the ice with you again. I got another spot we can try later this week. I'm going with the LX-3! The separation and crisp signal on these bad boys is awesome! And the adjustable zoom is a very nice feature to have for all fishing conditions!